Just a little over five months. Wow! In just a little over five months, one of my favorite women on earth gets married. I am so happy for her. She has found her match in Neil. The wedding will be at the beginning of September and we can't wait AND the bachelorette party will be a weekend on the Tennessee River at Cassie's parents' cabin. I wanted to make a list of memories about Mandy. Actually, in just over five months, you can make that Mrs. Mandy Vogeler nee Caffey. She is loyal and confident, so she's not worried about getting herself stomped. i.e., she'll stick up for you. She can dance. Really well. With feeling. LOL! She is wonderful with children, particularly mine. She makes me laugh non-stop every single time we ever hang out. She is marrying someone that is very similar to my own husband and makes a true effort to be friends with my husband. She knows when she looses an earring that no one else can find, I will go hunt it down. She has very good aim when throwing peanut m&m's at people in swimming pools. She is a very talented, yet humble, artist. Her paintings are divine. Her mother makes the very best homemade biscuits ever. I jumped off the roof of her garage in high school, busted my tail and it hurt. Mr. Charlie saw the whole thing. He didn't have time to stop me. Mrs. Judy never told us when she caught us with that Zima in the garage fridge. She drove a blue Corsica in high school. SWEET. She is a great person to counsel the young people that she helps. She spends a lot of her time doing things for others. She's got a brown-chicken-cow-now boat for taking to the lake this summer. She is dependable. And independent. She's I-N-D-E-P-E-N-D-E-N-T. Do you know what that means? But Miss Mandy Candy Kelly and Mr. Neil are on their way over. These babies are about to lose it when they see who knocks at the door. As you most know, I am more than happy to donate items from Brownbag Studio to things like silent auctions or for doorprizes. Here comes Peter Cottontail, Hoppin' down the bunny trail, hippitty hoppitty, Easter's on it's way! Today is pajama day at MDO. They will be watching a Peter Cottontail movie, having a PJ party and a special dessert. Miles wore her silky scottie dog pj's. She was precious. She also loved it when I sang the Peter Cottontail song for them last night. Speaking of the little sneakster, she rooked me into buying her two new DVD's at the store last night. She is now the proud owner of both Barbie: Rapunzel and Barbie: The Princess and the Pauper. Good thing I got a new TV for my bedroom for Christmas. Otherwise, they would't be able to steal my TV for their room to lounge in bed, eating snacks, slipping out accidental toots and watching Barbie. Miles always says, " excuse me~ I tooted!!" Lola, well, not so much but she's trying. Lola loves crackers. She also loves cracker crumbs so that she can make an 'innocent' mess. As in, "Look at my puppy dog eyes, Mom-ma! Don't fuss at me since I am only almost two and what did you expect me to want to do with the cracker crumbs on my plate. Of course I dumped them on the couch intentionally and then took my grubby little paw and sent them swirling to oblivion. It isn't my fault you gave me crackers." Stephanie tagged me with the Meme challenge. 5. Remember to leave a comment on the tagged blogs with an invitation to play! Here is mine: My life equals hugs and comfort. Now the hard part: Tag you are it!!! 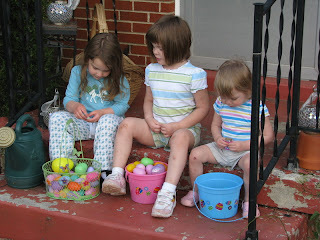 We went to an Easter egg hunt on Sunday at our friend Shea's house. 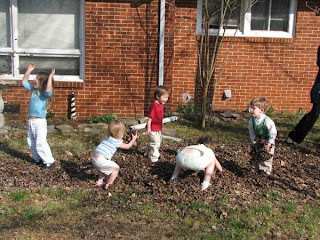 It was super fun and the kids had a total ball playing in the leaves after scarfing down some candy. Shea had a delicious cake, as she always does. Miles: Momma, da Easta Bunny came to my class today!!!! Me: Wow, Milesy! That is awesome! I have never to seen the Easter bunny in person!! What did he look like. Later she told Aunt Dinky that the Easter bunny "was wearin' a bunny costume!!" Jibber Jabber. Jibber. Jabber. Jibber Jabber is Lola's new nickname. Miles came home from Mawmaw and Pop Pop's house calling Lola, "Jibber Jabber" and it is so sweet. She says it so endearingly. I know that My dad has to have gotten this one started. Lola has just really learned how to speak out loud so much more over the past two weeks. I don't have a kidney stone. The CT scan showed inflammed tissue in my side/back. Last week I had a bad cold. Then on Wednesday of last week, I started having severe back pain on the left side. I thought I had pulled a muscle carrying Miles upstairs. Apparently, there is a good chance that i did not, in fact, do that. it now appears that I have kidney stones. Nice! I have a cat scan tomorrow to find out for sure. The pain has gotten worse and worse, to the point that I now can't sit still for long bc my back starts howling in pain. The doctor said my area of pain is a little high for a kidney stone but based on my description of the problem and some tests, I probably have kidney stones. Pray I don't have to have surgery! As you may know, I actually like having surgery. I know. I know. I am a freak of nature. However, I don't want to have surgery right now. He said if it gets to where I am still in pain after taking two (2!) vicodons, go to ER. Nice. It is official. I joined the league. I am now a provisional member Junior League.